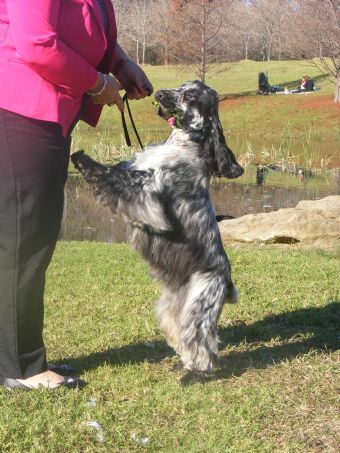 We are very proud to introduce our "Willis", pictured here at 20 months! He is an extremely handsome silver blue boy of very English type. He has loads of bone and substance with great angulation, a short coupled body, huge spring of rib and strong topline with correct tail set. He has a very outgoing, but naughty nature and an ever wagging tail. 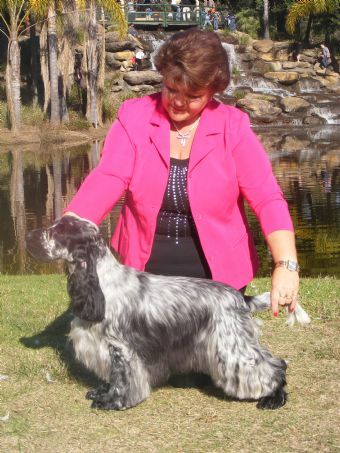 Willis is already a Multi Challenge, Best of Breed, R/U Best of Breed & Multi Class In Group Winner. He has many admirers as he struts his stuff around the ring. We look forward to campaigning him and what his future holds. "Blue roan with excellent bone and substance. Masculine head, kind eye and expression. Neatly made neck and well angulated forehand. Excellent legs and feet, on which he scored. Deep, well sprung ribcage. Short back, compact loin and couplings. Muscular, well developed thighs. Sound, free mover." "Superb light blue of good breed type presented in immaculate order this young dog combines substance with quality all through, excellent masculine head with kind expressive eye, good balance all through with typical occiput, superb neck into shoulder with correct front angulation, superb legs and feet, deep well ribbed body with good underline well developed quarters with excellent width of quarter and muscle-tone correct tailset and croup, moved soundly and happily with drive showing the correct width behind many other exhibits failed in this area today. 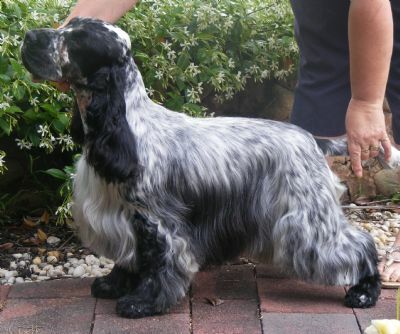 A truly lovely cocker which I would be happy to own won this class with plenty to spare and the reserve dog.